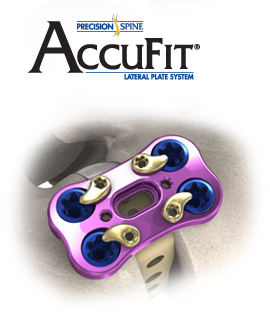 The AccuFit® Lateral Plate System is indicated for use via a lateral or anterolateral surgical approach above the bifurcation of the great vessels in the treatment of thoracic and thoracolumbar (T1-L 5) spine instability. 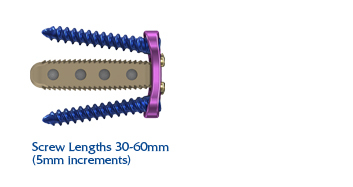 The AccuFit® Lateral Plate System consists of non-sterile, single use, titanium alloy (Ti-6AI-4V ELI per ASTM F136) rigid plates and bone screws of varying sizes and lengths. The plate attaches by means of screws to the lateral portion of the vertebral body of the thoracolumbar spine (T1-L5). The system includes instrumentation which assists in the surgical implantation of the device. The AccuFit® Laterall Plate System implants and instruments are provided non-sterile. They require sterilization prior to use. Each plate is matched to 8, 10, 12, 14 & 16mm ShurFit® LLIF interbody cages.